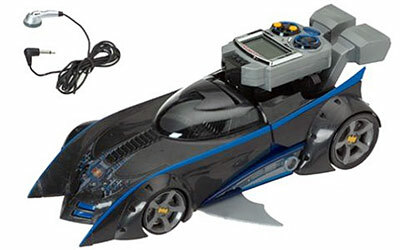 The ultimate electronic Batmobile uses revolutionary new Batwave technology to interact with The Batman animated series. A detachable handheld Batlink receives real-time signals from the television show. When the Batlink is attached to the Batmobile, the vehicle reacts to action on the television screen with transformations, lights, and sounds. The Batmobile has a speaker and holds one figure. With the removable Batlink, kids can hear secret messages from Batman and download villains, weapons and upgraded Batmobile features from the TV. Later, those can be used in customizable adventures, Batman missions, and much more. Includes vehicle, Batlink and an earpiece.